Pleomorphic Adenomais a very common type of non-cancerous tumor also known as benign neoplasm. It is found in your salivary gland and most common tumor of the parotid gland. Pleomorphic Adenoma term derived from pleomorphism ie. its variable appearance seen in light microscopy. It is a Benign Mixed tumor (BMT’s) type of salivary gland because of its pleomorphic appearance, characterized by neoplastic proliferation and having a malignant potentiality. Tissue origin that makes mixed tumor comes from different types of cells. The parotid gland is the largest salivary glands and it has two lobes. The superficial lobe and the other is the deep lobe both lobes are separated by the facial nerve. A Pleomorphic Adenoma is a benign overgrowth arising from the salivary gland tissue and it is a painless hard, mobile, solitary mass. The growth is usually mobile unless found in the palate and when found in the parotid tail, it is present as an eversion of the ear auricle. Although it benign tumor Pleomorphic Adenoma but have the capacity to grow in large proportions and become malignant. The epidemiology of Pleomorphic Adenoma occurs in both men and women, but this tumor is usually occurs in adults between the age group of forty five and sixty. It is more prevalent in women (age between thirty to sixty years) than men. It is seen in infants, children, young adults too. 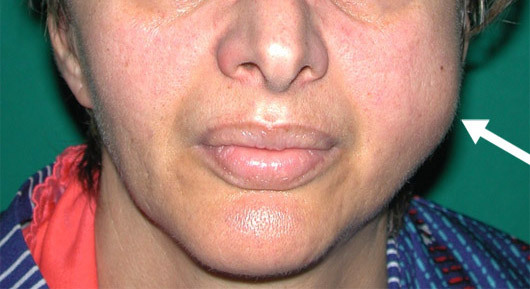 Pleomorphic Adenomas are not unique to the parotid gland or other salivary gland and may arise in any of the various glands in the body. Pleomorphic Adenomas account for 60% to 80% of all tumors of the parotid gland. Pleomorphic Adenomas are slow growing masses that are painless in the early stage. As these tumors start to grow larger it causes complications in ear and mouth. An interference with the nerves that control your facial muscles. The most common cause of Pleomorphic Adenoma is blockage of salivary gland, which inhibits the drainage of saliva from the glands. These are the preferred methods to diagnose size and location of the tumor. However, MRI testing is sufficient for differentiating Pleomorphic adenoma from the other growths. A biopsy should be taken to rule out, malignancy ie. which type of tumor it is benign or malignant. When the doctor finds any adenoma, they definitely will go for FNA (fine needle aspiration) to see, it is Pleomorphic adenoma. The word Ayurveda is a Sanskrit term. Ayus meaning life and Vid meaning information or science. Ayurveda is the oldest medicinal system in the world, which originated in the Vedic culture of India, gives the power to the body that prevents the development of diseases. The Ayurvedic treatment includes balancing the disturbed dosha by herbs. Herbs are 100% natural and pure to mankind. According to Ayurveda, formation of a tumor is due to the imbalance in Kapha and Vata dosha. Vata dosha is responsible for the irregular division of cells while Kapha dosha is responsible for the growth of tumor cells. Dr. Vikram Chauhan, is very much renowned Ayurvedic expert in India. 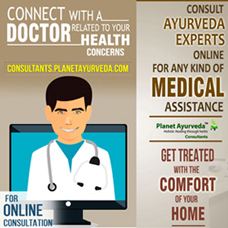 His organization Planet Ayurveda distributed his medicine all over the world. Planet Ayurveda offers natural and effective products for Pleomorphic Adenoma. Planet Ayurveda offers various herbal remedies for Pleomorphic Adenoma that provides effective results on symptoms associated with this disease. These capsules are used in Ayurveda to balance Pitta and Vatta dosha..
Rejuvenates and strengthens the body. Dosage -1 cap. twice daily, 30 minutes post meals with plain water. Dosage :-1-2 cap. twice daily, 30 minutes post meals with plain water. Pippali (Piper longum), Chitraka (Plumbago zeylanica), Danti (Baliospurmum montanum), Shudh parad(Purified murcury), Shudh tankan(purified sodium biborate), Sarjakshar (Sodium carbonate), Yavakshar (potassium carbonate). Dosage :-2 tablets twice daily, 30 minutes post meals with plain water. According to Ayurveda our body is made up of 5 elements – Earth, Water, Fire, Space and 3 physiological humors – Vatta, Pitta, Kapha which represent 5 elements. Pitta balance capsules from Planet Ayurveda is a great product which helps to balance pitta dosha in our body which is a root cause of infections and disorders. Pitta represents the fire. This medicine has cooling effects on the body. Its ingredients are: Akik Pishti, Jawar Mohra Pishti, Kamdudha Ras, mukta Pishti, Giloy Satva. Dosage :-1 capsule twice daily, 30 minutes post meals with plain water. Curcumin is most the common compound of turmeric. It is most common and ancient herb used in medicine, So it has many benefits. Curcumin capsules are used in the treatment of cancer. Anti-oxidants present in the herb improves the health and immunity and it has anti-inflammatory effects. It is rich in antibiotics. Dosage :-1-2 cap. daily with milk or water. Dosage :-Consume 5-10 grams or 1 to 2 teaspoons with warm water or honey. Dosage for children below 5 years :-1-2 grams, 1-2 times a day, along with a teaspoon of honey or warm water / milk. Dosage for children between 5-12 years of age :-5 grams, 1-2 times a day along with a teaspoon of honey or warm water / milk.